Most athletes probably think they could hold their own in a sport other than their chosen one. Take that idea, and a bunch of world class athletes, and have them perform in a series of decathlon type events, and you have the basic idea of the Superstars® competition. Anything and everything you want to know about this televised sporting event of the past can be found at a wonderful website run by James Medler. Visit www.thesuperstars.org to see what I mean. The images in this post are courtesy of Jim at thesuperstars.org. 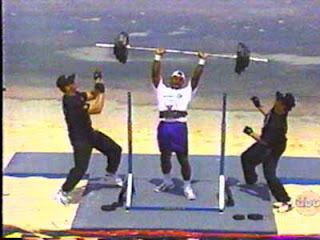 Herschel's first foray into the competition was in 1986. He did not do well, finishing seventh. He himself describes it in his autobiography, "Breaking Free". Walker explains that he didn't even make the finals, and finished dead last in the tennis competition that year. 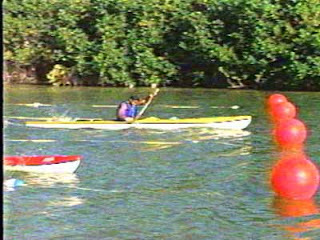 As an example of his dedication and perseverance, Herschel said in the book that he practiced tennis "like a madman", and in the following year's competition, 1987, he not only finished first in the tennis event, but won the overall title, the first of two that he would win, as he also copped the title in 1988. Also in 1988, Herschel was on the winning team for the NFC Superteams competition vs the AFC. His next entry would be in 1989. He narrowly missed out on a third straight title, losing to wide receiver, Willie Gault, in the finals. Then in 1991, he finished second to baseball player, Kelly Gruber, in that year's finals. In 1993, Herschel made the finals, but had a tough go of it. 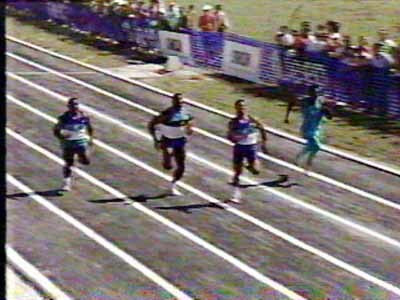 He went off course in the bike race and was blown out in the 100 yd dash by high jumper, Mike Powell, who ran a then record 9.22 seconds. 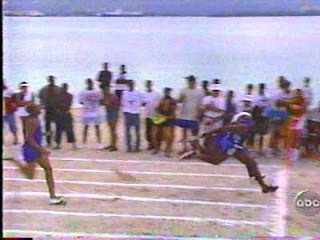 Walker finished only 6th in that year's competition. In my opinion, Walker's final competition in 1998 was perhaps his most impressive. He finished 3rd overall, but at age 36, he lifted 320 lbs overhead, to win the weightlifting portion, and just nipped a 26 year old Kordell Stewart at the tape, to win the 100 meter dash in a time of 10.24.
second from left in the 100 yard dash. beating a 10 years younger, Kordell Stewart in the 100 meter dash. Though I have no Herschel memorabilia that pertains to his time in the Superstars competition, I thought it was a neat part of his athletic career, and wanted to include it in the hoard. This is a neat idea. I never heard of this competition before but I bet it was a lot of fun to see athletes doing sports they weren't known for. Thanks for bringing it up! I'll be checking out the linked site shortly too. Thanks Billy. I always loved this show back in the day.